Light showers in Piccadilly. Devastating floods in Bangladesh. A new, unique rain-triggered advert, highlighting the devastating impact of climate change on the children of Bangladesh, had just appeared on one of the famous screens in Piccadilly. In the week before world leaders meet to make crucial decisions on the climate in Paris, we’ve launched the world’s first disruptive rain-activated advert, which will interrupt the One Piccadilly screen every time it starts to rain. The advert, featuring iconic children’s toys washed up in the aftermath of a flood, aims to send a powerful message about the loss of childhoods in Bangladesh due to worsening storms and cyclones. With children unable to go to school, and their lives at risk from drowning, we want to highlight the saddening reality that children’s futures are literally being washed away by climate change. ActionAid is working hard to help people in Bangladesh adapt and survive the impacts of climate change – but we can’t do this alone. Our advert invites everyone to join us at the People’s Climate March in London this Sunday, and help us call for the most vulnerable people to be put first in any climate deal. Here’s how it all works. 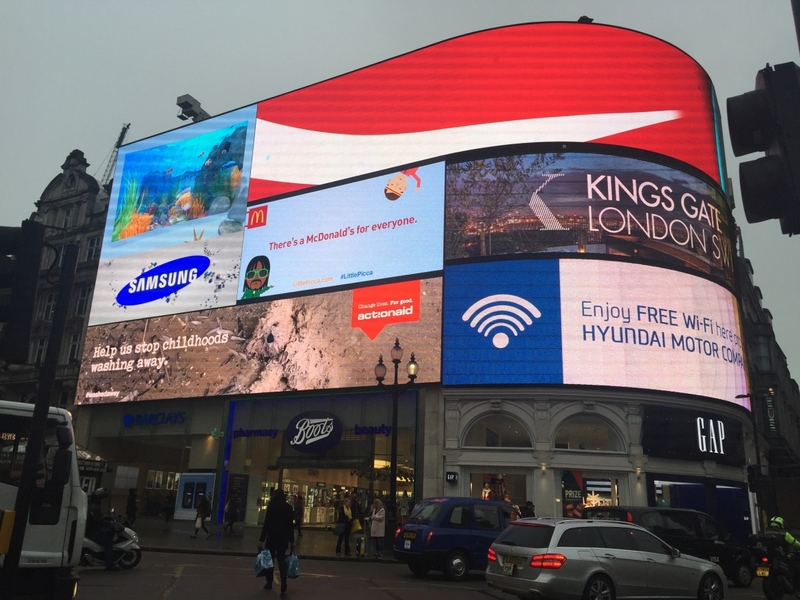 Our advert is activated by real-time data from a nearby MET Office weather station, which feeds into the system that controls the Piccadilly screens. When it detects rainfall, it prompts the ActionAid ad to appear on the screen, disrupting other adverts from big brands throughout the day. It reveals tailored messaging depending on how heavy the rain is – whether it’s drizzle, a light shower, or heavy rain. We made the ad with the incredibly creative people from communications consultancy Weber Shandwick, who offered us pro-bono support and brought the idea to life, and the iconic media space was donated by media agency Clear Channel. Together, they’ve helped us take this important message to a huge audience at a time when public concern about climate change is increasing. A new poll commissioned by ActionAid shows that more than a third (38%) of the British public is more worried about climate change than they were five years ago. Of these people, we were encouraged to find a quarter (25%) say they are more concerned with the impact on people in developing countries. Significantly, just before the UN Climate Conference takes place in Paris, our research found that over half (53%) of the British public feel that not enough is being done by global leaders to tackle climate change. So if you are passing by Piccadilly Circus this week and it starts to rain, look up. Surrounded by shiny fast food and phone adverts, the images of children’s toys washed up after a flood show up in stark contrast. The message packs a punch: climate change is happening now, it’s affecting children’s futures, and now’s the time to do something about it.